"The Gaze of Predators and the Redefinition of the Human"
Presented by Karla Armbruster in the Department of English. Within contemporary ecocriticism, considerable thought goes into the question of how to shift beliefs and values — especially within wealthier, more Westernized cultures — towards a more ecological view that understands humanity as inseparable from the rest of nature. 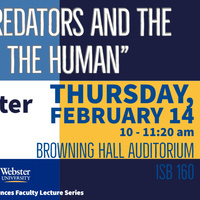 This presentation explores literary and real-life instances of nonhuman animals preying on human beings in order to argue that a different relation to our potential predators can foster an understanding of the human body as temporary, unstable, vulnerable, and belonging to the rest of the world as much as to the individual who claims it. This ultimately transforms not just our sense of the human relationship to nature, but also our definition of what it means to be human in the first place.